In the winter garden annuals have left the stage and perennials have taken a few steps back. What remains is the patterns of our garden beds as well as our hardscapes, shrubs and of course the trees. If you have room in your landscape, now is a great time to evaluate some trees for winter interest. There are many to choose from. Here are three that kept moving to the top of our list. Holly trees offer the landscape glossy, evergreen foliage coupled with red, white and yellow berries and the opportunity to capture the quintessential snow on fruit (technically drupes) and bird photo in the winter. 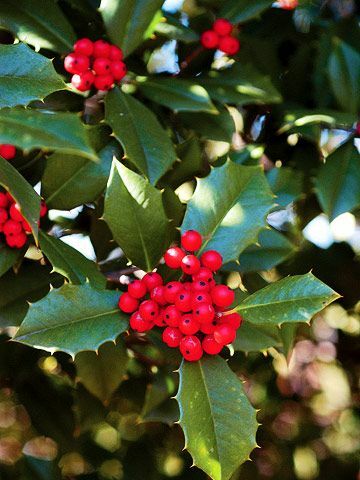 Holly’s scientific or formal name is Ilex and can be in the form of a tree or shrub and is either deciduous or evergreen. So if a holly is what you want, chances are we can find a variety the will work perfectly with your existing garden design. Many hollies need a male and female plat to have drupes. So if the fruit is your main attraction work with your designer to secure the proper plant. The leaf margins can be wicked! Some hollies have very sharp points on their leaves and make weeding/gardening around the tree tricky. Wear gloves and a thick shirt. Magnolias are a slippery slope. From varieties with massive leaves, wispy white spring flowers to thick, leathery pink petals, even some with yellow blooms, the magnolia offers us about every option imaginable. But in the winter, it’s the Southern Magnolia that has us smitten. Large, glossy green leaves with a fuzzy brown underside, and a majestic shape and size that screams this garden is established and classy! We are on the southern tip of the ideal growing condition for Southern Magnolias. There have been winters when the trees have taken a hit, so site the tree accordingly. There is one across the street from my home, tucked behind a building, surrounded by a parking lot (heat source) in a large garden bed that looks amazing. It’s location is a micro-climate, one that will protect it from our harsher winters. It behooves you to work with a designer when placing such a tree. The bark on this tree, as it name implies, is like sheets of paper, slowing pulling away from the trunk revealing subtleties of differing colors resulting in textures and patterns only nature could create. The bark is lovely in the spring and summer, but this tree is often planted as part of garden, which when it’s in its full display, competes with the tree. In the winter and late fall, this tree shines. It’s simply stunning to see its gorgeous bark contrasted against a landscape blanketed in snow. Take care when placing this tree, not for its protection (it sits comfortably within our gardening zone) but to be able to enjoy its best feature, its bark. This is not a back of the woodline tree. Bring this up closer to the house, patio or sitting area in the garden so that it can be enjoyed. Your designer will select companion plants that accentuate is best feature.